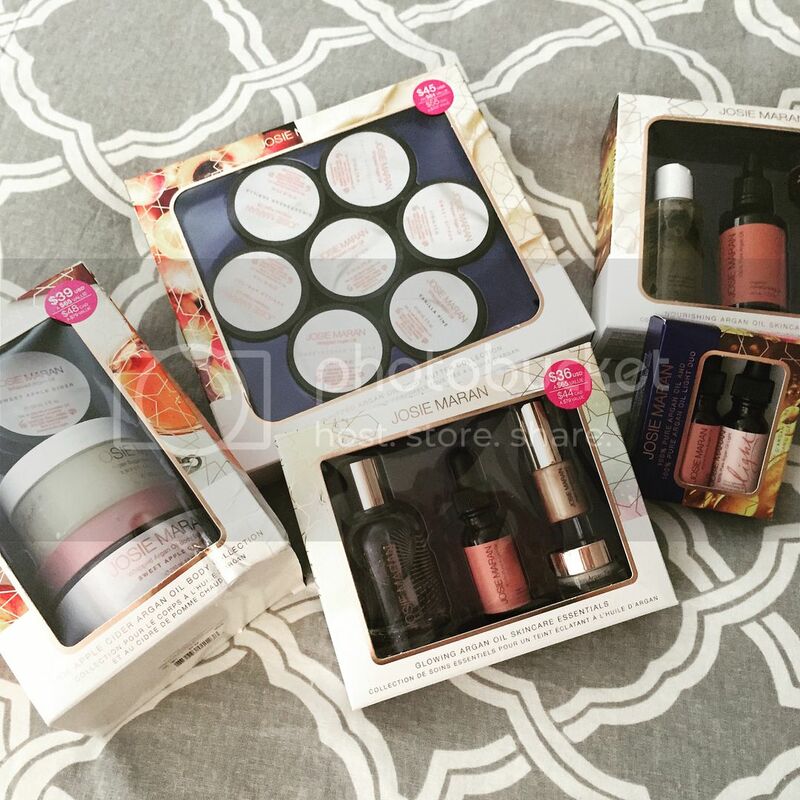 Pammy Blogs Beauty: Holiday Beauty Gift Guide 2016: Josie Maran Holiday Gift Sets! Holiday Beauty Gift Guide 2016: Josie Maran Holiday Gift Sets! The Holiday Season is almost upon us! So, it is time for me to launch my Holiday Beauty Gift Guide 2016! My Holiday Beauty Gift Guide is a series of posts highlighting some of the best holiday sets, assortments, and offerings in the beauty world for this year. I am excited to give ya'll the scoop on some awesome products and deals! 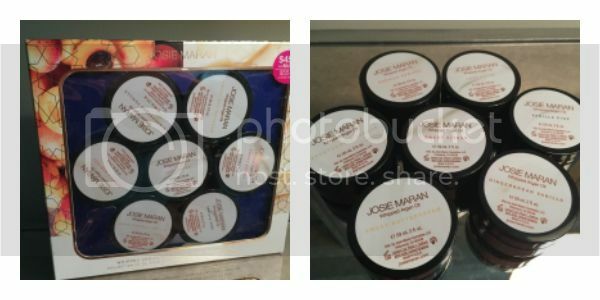 Josie Maran Cosmetics has a fantastic lineup of Holiday Sets this year. It can be tricky buying skincare for other people. However, I think that any of these sets from Josie Maran would work for just about anyone on your list. Sure, skincare is tricky...but, Argan oil is so universal. It works for just about every skin type. Plus, you can never go wrong with items like body butters and body scrubs. So, lets dive in! I am going to give the the lowdown on each set. Warm Apple Cider? Yes, please! Consuming delicious warm Apple Cider is literally one of my favorite things about Fall and Winter. Sure, I love pumpkin-spice everything this time of year, too...however, I honestly gravitate towards the sweet and fresh scent and flavor of Apple Cider even more! A pair of Josie’s Argan Oil-infused, autumn-scented skin softeners, formulated to uncover your most luminous, radiant skin from shoulders to toes. Slough off dead skin cells with the exfoliating Argan Sugar Balm Body Scrub, then follow with the velvety-soft, mega-moisturizing Whipped Argan Oil Body Butter. All the while you’ll experience the sweet but subtle aroma of one of fall’s most comforting staples – warm apple cider. Argan Sugar Balm Body Scrub: Delicate sugar crystals gently polish away dead skin cells, while a combination of 100% Pure Argan Oil, coconut oil, and shea butter seal in moisture and rejuvenate dry, cracked skin. Whipped Argan Oil Body Butter: (both a full size and a mini are included) Spun into creamy perfection with Josie’s 100% Pure Argan Oil, this lightweight lotion hydrates, nourishes, and replenishes the skin’s essential fatty acids, while also restoring softness, improving all-over texture and tone, and lightly scenting the skin. Retails for $39. Available at Sephora starting Dec 1st! This set is a fantastic introduction to Argan Oil! 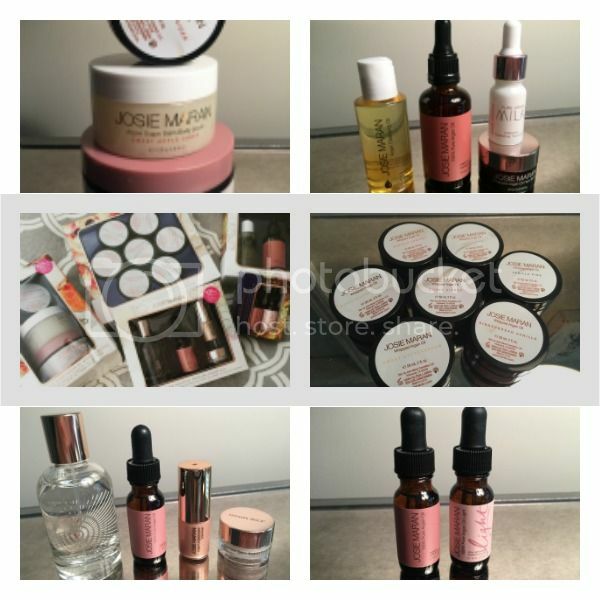 Not only do you get the classic pure Argan Oil, but also some of Josie Maran's argan-infused bestsellers. At $49, this is a fantastic price to explore the best of the line! A special collection of luxe skincare essentials, all made with Josie’s celebrated 100% Pure Argan Oil. Start with the 3-in-1 Argan Cleansing Oil, a gentle, multi-tasking cleanser that deep cleans, removes makeup, and moisturizes all in one. Follow with the Pure Argan Milk Intensive Hydrating Treatment, a lightweight but super-potent serum that penetrates deep into the pores to plump, repair, and preserve aging skin. Next, nourish your complexion with the luxuriously rich Whipped Argan Oil Face Butter, then follow with a few drops of 100% Pure Argan Oil to seal in essential fatty acids and antioxidants. Argan Cleansing Oil: This gentle, all-natural cleanser melts away makeup, dirt, oil, and debris without stripping your skin of moisture. Ideal for all skin types, the non-greasy formula leaves your complexion clean, healthy-looking, and velvety soft – never slick, tight, or dry. Pure Argan Milk Intensive Hydrating Treatment: A breakthrough treatment serum that combines the deeply hydrating properties of purified water with the skin-rejuvenating micro-droplets of Josie’s 100% Pure Argan Oil. The result is a lightweight yet powerful skin-saver that penetrates deep to fortify, repair, and preserve your skin’s youthful appearance. Whipped Argan Oil Face Butter: Whipped to buttery perfection with 100% Pure Argan Oil, this light yet luxuriously rich face butter absorbs instantly to smooth, hydrate, and firm the skin with essential fatty acids and anti-aging vitamin E.
100% Pure Organ Oil: It’s just one ingredient – 100% pure, organic Argan Oil – but Josie’s antioxidant-packed staple is a multi-tasking miracle oil that hydrates skin, reduces wrinkles and fine lines, and improves skin tone and texture. Smooth in just a few drops for the perfect finish to your ultimate Argan Oil skincare regimen. This kit is such a cute idea: skincare and makeup essentials designed to give your skin a beautiful glow! I mean, who doesn't want glowing skin...especially during the Holidays! Plus, $36 is a great deal for this set! A special collection of nutrient-rich skincare essentials, all made with Josie’s celebrated 100% Pure Argan Oil. Formulated to give you a flawlessly luminous look, each offering hydrates, nourishes, and enhances your overall complexion, leaving you with healthy, glowing skin. Enjoy a revitalizing spritz of the Nirvana Hydrating Treatment Mist, smooth away wrinkles with Josie’s original 100% Pure Argan Oil, finish and prep your face for makeup with the Surreal Skin Argan Finishing Balm, and add an extra illuminating boost to your moisturizer or foundation with the Argan Enlightenment Illuminzer. This kit contains all the essential elements for a truly transformative, Argan Oil-infused skincare routine. Nirvana Hydrating Treatment Mist: Designed to amplify the benefits of your everyday skincare ritual, this moisturizing mist nourishes, softens, and stimulates collagen production with coconut water, multi-fruit complexes, and of course, Argan Oil. The alcohol-free formula can be used first thing in the morning, as well as throughout the day to revitalize skin and boost hydration. 100% Pure Argan Oil: Loaded with vitamin E and essential fatty acids, Josie’s 100% natural, organic, and antioxidant-rich staple is a multi-tasking miracle oil that hydrates skin, reduces wrinkles and fine lines, and improves overall skin smoothness, tone, and texture. It can also be used to treat split ends and condition cuticles. Surreal Skin Argan Finishing Balm: The first ever anti-aging skin finisher and makeup primer in one, this lightweight, deeply nourishing balm seals in the benefits of skincare products such as moisturizers and serums, while also prepping your skin for flawless makeup application. It’s packed with skin-saving essentials including hydrating Argan Oil, conditioning Shea Butter, and elasticity-boosting vitamin B3. It can also be used throughout the day to revitalize your complexion and refresh your makeup. Argan Enlightenment Illuminzer: Packed with high-performance crystals and multi-colored, light-reflecting pigments, this Argan-infused liquid adds instant radiance to any complexion. It contains natural ingredients such as Madonna Lily and Poet’s Narcissus, which work together to brighten skin and even tone. It blends seamlessly into oils, moisturizers, or foundations for a warm, lit-from-within glow. Oooh! This set is so enticing. A huge set of mini body butters in such delightful scents! I love the texture of the Josie Maran body butters. So moisturizing and they leave my skin super soft. A collection of Josie’s incredibly creamy, mega-moisturizing Whipped Argan Oil Body Butters in three brand-new, sumptuous scents – Gingerbread Vanilla, Sweet Buttercream, and Vanilla Pine. Infused with powerful antioxidants and 100% Pure Argan Oil, all three revitalize and enrich the skin, replenishing essential fatty acids and improving overall tone and texture. Effortlessly lightweight but exceptionally nourishing, Josie’s whipped body butters offer deep, long-lasting hydration and softer, healthier-looking skin with every use. Whipped Argan Oil Body Butter in Gingerbread Vanilla: Rich and warm with a slightly spicy gingerbread kick, this body better smells (almost!) good enough to eat. Whipped Argan Oil Body Butter in Sweet Buttercream: Surround yourself with the comforting scent of buttercream frosting – not overly syrupy, just soothing, sweet, and all-around decadent. Whipped Argan Oil Body Butter in Vanilla Pine: Uplift your spirit with this invigorating combination of lightly fragrant vanilla and refreshing forest pine. 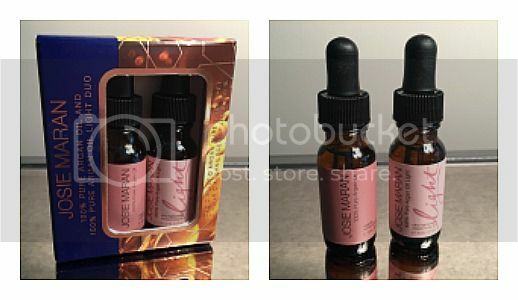 If you try nothing else in the Josie Maran line, you absolutely need to try out the Pure Argan oil. For only $18, this set is a perfect introduction to Argan Oil: 2 mini bottles for you to try with two different Argan Oil formulas. A bottle of only the very top-grade, 100% natural, 100% pure, and 100% organic beautifying Argan Oil. 100% Pure Argan Oil, Josie Maran’s number one, best selling, blockbuster natural beauty solution for dry skin, hair, and nails, is still a cult favorite. Made in Morocco by local women’s co-ops and first cold-pressed to preserve quality, this “liquid gold” nourishing oil remains the go-to beauty must-have for those in the know. This multitasking hero ingredient is the cornerstone of Josie’s line because it delivers amazing moisturizing benefits for every skin type, including product sensitive or dry skin. Use it on your face as a daily moisturizer, or dab on hair to turn brittle split ends into lustrous strands. 100% Pure Argan Oil also works beautifully to condition frayed, rough cuticles, or to soften rough feet into perfect sandal-ready condition. 100% Pure Argan Oil is bursting with high levels of all-natural antioxidants, vitamin E and essential fatty acids that deliver skin, hair, and nail health and radiance, while protecting against premature aging. Known since ancient times as a healing ointment, this luscious oil has been scientifically proven to leave skin smoother, hydrated, and line free in only four weeks. Concerned about putting an oil on your combination or breakout prone skin? Perhaps you want to start with the Argan Oil Light. This is an ultra-lightweight version of Argan Oil. Josie Maran was able to release the lightest elements of Argan Oil while still maintaining all the amazing skin benefits in this super light formula. New 100% Pure Argan Oil Light is still packed with Vitamin E and emollient fatty acids like the original, so it deeply nourishes. It also absorbs quickly, leaving behind a luminous, semi-matte finish. Perfect for all skin types, especially breakout-prone and sensitive, Argan Oil Light actually reduces sebum production—so it’s great to wear under makeup or with no makeup at all. Sustainably produced by Moroccan women’s co-ops, Josie’s top grade oil is extracted from organic Argan tree nuts, then cold pressed to maintain its essential hydrating ingredients. 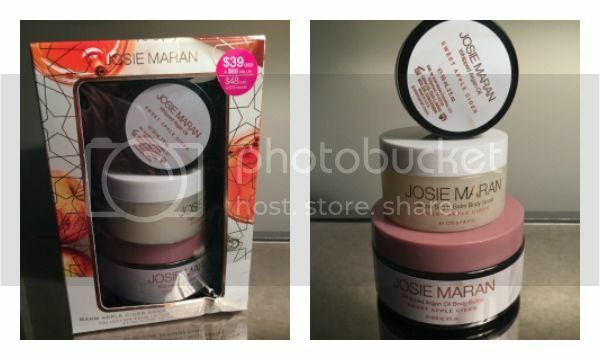 If you are looking for some fantastic gift sets for the skin and body care lovers in your life, be sure to check out these awesome Holiday 2016 sets from Josie Maran! Or...if you have never tried Josie Maran, this is a great time to try out a variety or products from the line for yourself for a great price!